Dustin Gold is an American talent manager and entertainment producer. Dustin Gold has been featured on ABC’s Good Morning America and in Bloomberg Businessweek and is well-known in the entertainment industry for developing and managing Barack Obama impersonator Reggie Brown, Sarah Palin impersonator Patti Lyons, Mitt Romney impersonator Mike Cote, and Barack Obama impersonator Louis Ortiz. Dustin Gold and his entertainment management firm, William Gold Entertainment, have a history of producing prolific talent, and have been responsible for some of the most notable media circuses over the past few years. 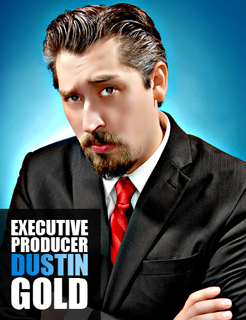 Dustin Gold is a founding partner and serves as Executive Producer of Politicos Comedy Brigade, the world’s best political comedy team, which features the top impersonators of American Presidents, politicians, and pundits. As CEO at William Gold Entertainment and Executive Producer for Politicos Comedy Brigade, Dustin Gold has worked with major global brands including Microsoft, LinkedIn, Virgin America, YouTube, Unilever, Yahoo!, MTV, AOL, FOX News Channel, ESPN, USO, CNN, WWE, MSNBC, The Onion, and Will Ferrel’s Funny or Die.